It’s quite fitting that the latest from Venomous Maximus gets reviewed in the same issue of MSJ as Black Sabbath’s 13. Not because the records sound that much alike, but because they represent opposite ends of a circle. Black Sabbath are arguably the band that started the genre of dark, doomy heavy metal and 13 is likely the end of the road for them. Texas’ Venomous Maximus are just at the start of their career and herald a new era of the music that Sabbath pioneered. The good thing about Beg upon the Light is that it is not just another imitation of Black Sabbath. This band is determined to create their own sound - and they succeed. There is certainly some of that gloomy Sabbath sound here, but there are influences from Thin Lizzy and dark prog rock as well as more modern influences like Mastodon. The band has a unique and very organic sound, with the very dramatic vocals of one Gregg Higgins leading the way. 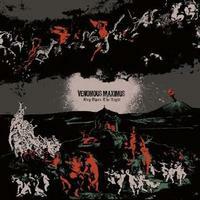 Higgins’s emotional singing may be hard for some to adapt to, especially when he ventures into snarls and bellows, but he’s a big part of what makes Venomous Maximus an original experience. Beg upon the Light is an album that demands multiple listens to get all the nuances out of it. It’s not often these days we hear acts bursting out of the starting gate with their own identity, so enjoy this one and muse on the possibilities of what Venomous Maximus might create in the future! A prolonged, eerie organ note starts this off, leading into a very spacey and early 70s prog feel. It’s a little like “Tubular Bells.” It does sound a lot like funeral music and serves as a super atmospheric opening introduction to the album. Multi-tracked guitars and an invocation from Gregg Higgins initiate the album proper. This turns into a deliberately paced, chugging metal track that kind of evokes a 70s feel without becoming obviously “retro.” You get the feeling right away that you’re listening to something original. A bit more direct than “Path of Doom,” this is a power-packed cut with some killer riffing that sounds like Black Sabbath meets Thin Lizzy. Gregg Higgins gives one of his most histrionic vocal performances here as well. Here’s an eerie, brief acoustic tune with a strong psychedelic feel. Higgins’ vocals are much deeper and kind of creepy. The slight organ touches add some spookiness. The Thin Lizzy feel is very pronounced with some of the almost Celtic guitar riffing on this cut. It’s a very heavy song, with a ton of crunch on the verses and pounding drum work. The structure of the songs here is unpredictable and doesn’t follow the normal verse/chorus/verse patterns at all. That is most noticeable on this song. The band tears the house down with this ripping metal rocker. If the opening power chords of this one don’t get them headbanging, forget it. Higgins’ vocals are plaintive as they exclaim “I need a body to control / I need a human soul / Why did the gods make us this way?” This is the best cut on the album, hands down. This song has the feel of an army trudging across a barren landscape: heavy, lumbering and dangerous. It’s quite an epic song with traces of Sabbath and High on Fire. It really grew on me. The pace is more aggressive for this tune, and the vocals are not so much sung as snarled. By now, the band have established their trademark sound and the riffs and vocal lines fit the pattern of much that has gone before. Some much needed variety is added with this extreme change of pace. This is one of the saddest songs I’ve heard recently. It has a very “gypsy” like feel with weeping cellos and slow, melancholy acoustic playing. The singing matches the music as Higgins sounds like he’s about to break into tears at any second. Though the tune is brief, it shows the band’s willingness to add different influences into its metal framework. This song is hard driving metal but still has a very melancholy feel to it. There are some great riffs here and the lead guitar gets more of a chance to jam than on some of the other songs. This reminds me of old Mastodon in the way it's constructed from different tempos and hooks. It provides a powerful emotional climax to the album - just as it should.